Turkish President Recep Tayyip Erdogan's fierce campaign to help out his ideological next-of-kin, Egypt's former President Mohamed Morsi, is not doing any favors to the Muslim Brotherhood man. Morsi, who was deposed by General Abdel Fattah Al-Sisi in 2013, was recently sentenced by an Egyptian court to both death and life imprisonment, for separate crimes. Once again, Erdogan is more motivated by ideological rhetoric -- aimed at boosting his popularity at home and on the Muslim Brotherhood and Hamas streets -- than serving a democratic purpose, which, in this case, should be to save Morsi at least from his death sentence. First, Erdogan's loud rhetoric that he and Morsi represent their nations' will and that Egyptian President Sisi is a ruthless dictator, is problematic. In 2002, Erdogan's Justice and Development Party (AKP) came to power with 34.3% of the national vote and won 66% of the seats in Turkey's 550-member legislature. This month, during the June 7 parliamentary elections, the AKP, despite a 41% nationwide vote, lost its parliamentary majority for the first time since 2002. The election results in Egypt also do not comfortably support Erdogan's narrative. In 2014, about 10 million more Egyptians (or 19 percentage points) voted for the "dictator" Sisi than had voted for Morsi in the previous election. Ever since Morsi was overthrown in 2013, he became one of Erdogan's most popular election themes. In the AKP's local and presidential election campaigns in 2014, Erdogan made fierce speeches in favor of Morsi and the Muslim Brotherhood, and against Sisi, and mobilized millions of his Turkish supporters to rally against Egypt. Inevitably, Cairo was added to the list of world capitals lacking full diplomatic relations with Ankara. In fact, Erdogan was not helping his "brother" Morsi, but simply exploiting his tragic fall -- from presidency to a prison cell, where he awaits capital punishment -- in the quest of a few more Turkish Islamist votes. 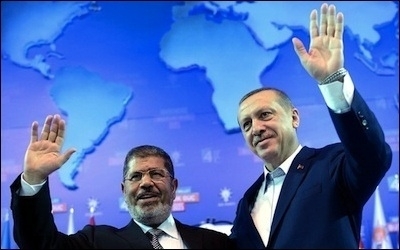 Erdogan has not given up exploiting Morsi. After the former president of Egypt received a prison sentence and the death penalty, Erdogan condemned the West for failing to prevent this tragedy, and accused Western countries of hypocrisy because they still maintain relations with the "dictator of Egypt." Erdogan said the verdicts mark Egypt's "return to the age of the Pharaohs." He added: "The West, which has abolished the capital punishment in its own countries, is merely watching the death sentence for Morsi." The protests were an Islamist show, not a pro-democracy rally or rejection of capital punishment. Meanwhile, Erdogan's supporters are still hopping from one rally to another, to protest the West and campaign for Morsi's release. On June 18, protests were staged in five different Turkish cities. In the fifth city, Erdogan's party's youth organization protested against the Cairo court's verdicts, with the Islamists' typical slogan: "Allah-u Aqbar!" [Arabic for "Allah is the Greatest!"]. As always, the protests were an Islamist show, rather than a liberal, pro-democracy rally, in which crowds from different ideologies would together to condemn capital punishment for any elected leader, Islamist or otherwise. 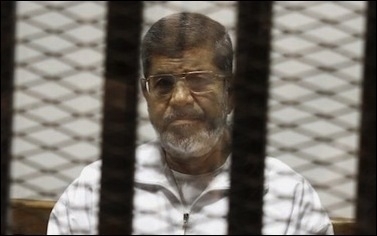 If Morsi is counting on Erdogan to save him, he's a dead man. In all that drama and Erdogan's exploitative campaign, there is just one important point the Turkish president carefully avoids explaining: his silence about his Wahhabi friends' silence in raising a finger for Morsi. Erdogan remains a staunch ally of the Saudi Kingdom, which generously flooded General Sisi's Egypt with petro-dollars after Morsi's downfall. Erdogan deliberately blames the Morsi drama on the Christian world, while the custodians of Islam in Saudi Arabia remain the best allies of the Egyptian coup-general-turned-elected-president, possibly privately hoping that Morsi is executed sooner than later. If Erdogan is serious about saving Morsi, he should speak to the Saudis, not the West. Not a word has ever been heard from Erdogan urging Saudi Arabia to influence Sisi regarding Morsi's death sentence. That is typical Erdogan. He speaks against "the death sentence," while ignoring the number of people executed every year in the homeland of his Saudi friends. He condemns the West for "just watching idly" Morsi's drama, while never even hinting that Sisi's Saudi friends might perhaps help as well. Erdogan's campaign to "save Morsi in the name of human rights and democracy" is distasteful and fake. If he is serious about saving his friend, Morsi, he should first speak to the Saudis instead of constantly blaming the fall of a Muslim Brotherhood leader on the Christian West. In the second round of Egypt's presidential election on June 24, 2012, the turnout was 52%, and the Muslim Brotherhood candidate, Morsi, won 51.7% of the national vote, or nearly 27% of the entire registered vote. In Egypt's presidential election in 2014, the turnout was slightly lower than in 2012, at 47.5%. General Sisi won 96.9% of the vote, or 46% of the total registered vote.